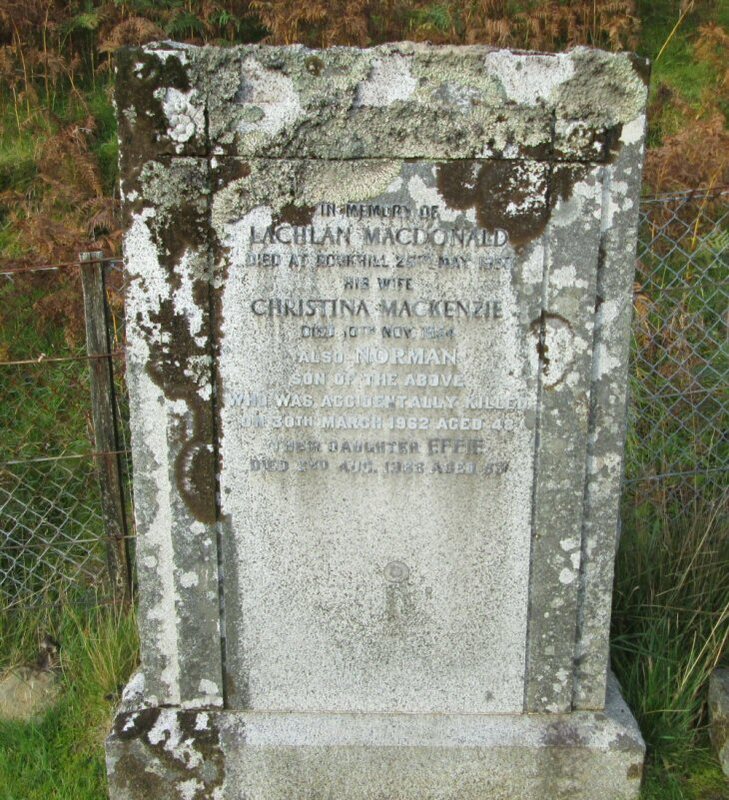 In memory of/LACHLAN MACDONALD/died at Roskhill 25th May 1938/his wife/CHRISTINA MACKENZIE/died 10th Nov. 1954/also NORMAN/son of the above/who was accidentally killed/on 30th March 1962 aged 48/their daughter EFFIE/died 2nd Aug. 1968 aged 63. Picture Added on 15 January 2014. Lachlan was the son of John Macdonald & Effie MacPhie~ he was my Great uncle..
Added by Flora.macdonald@cogeco.ca on 11 June 2014. Added by Flora Macdonald on 04 December 2014. Added by Flora Macdonald on 31 December 2015. Also buried here is John MacDonald born 1864 at Harlosh, son of John MacDonald & Effie MacPhie~ John M:1890 Marjory Cameron~ John died age 92 in 1956 November 30th at 1, Caroy Johm was the great uncle of Flora Macdonald....brother of my grandfather Hector born 1866...sadly his name is not inscribed on the tombstone at Struan ~ he was one of 12 children ~ A well known man at Caroy. Added by Flora Macdonald on 28 March 2018. Added by on 21 May 2018.